Protect your home from further damage with our attic restoration and sanitation. Dealing with an infestation is never easy on your own, but with the help of our experienced and trained technicians, you can eliminate persistent problems. Our reputable pest removal company does more than simply remove pests. We help you get your home back to normal. Please check out our guide to removing animals in your attic. Once an infestation reaches your attic, it can be quite some time before you realize that wildlife or pests have entered your home. Excrement and scratches have time to negatively affect your attic during the time these creatures go unnoticed. Following an infestation like this, you need immediate attic restoration. Our established company has a reputation for being the local experts on attic restoration, so give us a call when you have a pest infestation. With more than 25 years of experience in pest removal and control, we know just where to look to find the pests affecting your home. We also are experienced in finding all of the areas that may have been damaged by this infestation. This allows us to quickly and efficiently restore your attic and perform insulation removal to be sure the area is sanitary. We also provide you with the repairs and replacements you need to transform your attic back to its pre-infestation state. While some attic damage may be obvious to the untrained eyes of homeowners, other forms of damage may only be found with the help of professionals. By accurately locating and fixing both conspicuous and hard-to-reach damage, our trained team is able to provide your home with complete attic restoration. Performing restoration and taking out the soiled insulation is vital to the health of your home. If the steps needed to remedy the problem are not handled thoroughly, then permanent damage can leave your attic weakened or smelling foul for years to come. But there is no need to worry. Our team has years of experience and follows tried and tested techniques for the best outcome in your attic sanitation project. Rely on our team to provide you with the thorough attic sanitation service you and your family deserve. We first start by vacuuming up the animal droppings. When it comes to smaller animals, like birds, squirrels, bats, mice, and rats, their droppings are found in the form of many little pellets spread throughout the attic space. Sometimes they get into the ducts or even the insulation. In most instances, a small vacuum is all that’s needed to tackle this problem. But sometimes it’s more complicated. If the insulation has been damaged by a high concentration of animal droppings, then you will require insulation removal and replacement. If there are large animal droppings, these will have to be manually removed. Houses that have had raccoon or opossum infestations can expect this. Lastly, the attic is fogged. In most cases, this is the most important step. Though we remove the visible droppings, we must kill the bacteria and viruses that are left behind. Grease and oil from the fur and feathers of the animals, as well as urine, attracts parasites, fleas, ticks, and more of the animals that took residence in the attic. In many cases, mold can still grow in these conditions as well. The fog destroys any organic matter left behind without damaging your attic. Our team completely eliminates any of the pathogens left behind and breaks down waste and odors. 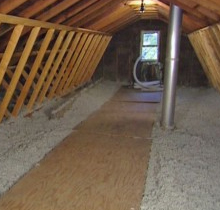 New insulation can be added and your attic will be returned to a clean and pest-free environment. If you think you have an attic infestation and need professional attic restoration, contact Wildlife Removal Utah today! We serve homes throughout Salt Lake City, Park City, Murray, West Jordan, Heber City, American Fork, Provo and Orem, Utah.